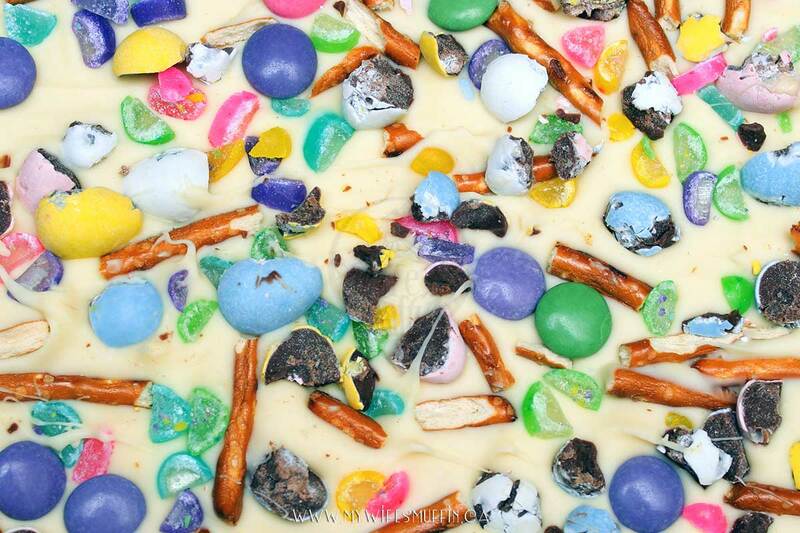 We couldn’t let the upcoming holiday pass without making at least one batch of white chocolate candy bark. 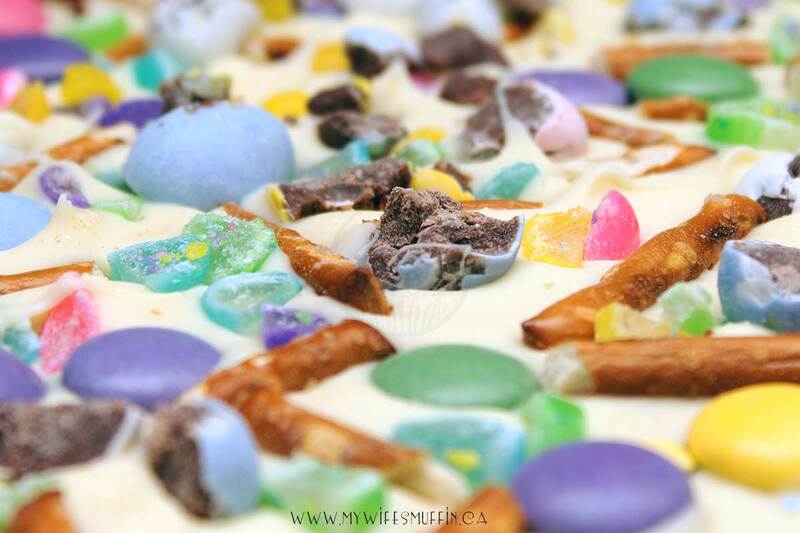 Of course, we had to post it here too, because let’s face it, almost every food blog has some version of candy bark. Since we’re a newer blog, we definitely have some gaps to fill in the recipe department, particularly when it comes to trendy eats. A couple weeks ago we shared my wife’s Sweet On You Oreo-Stuffed Chocolate Cupcakes because we were feeling a little left out that our blog didn’t have a stuffed cupcake recipe of some kind. 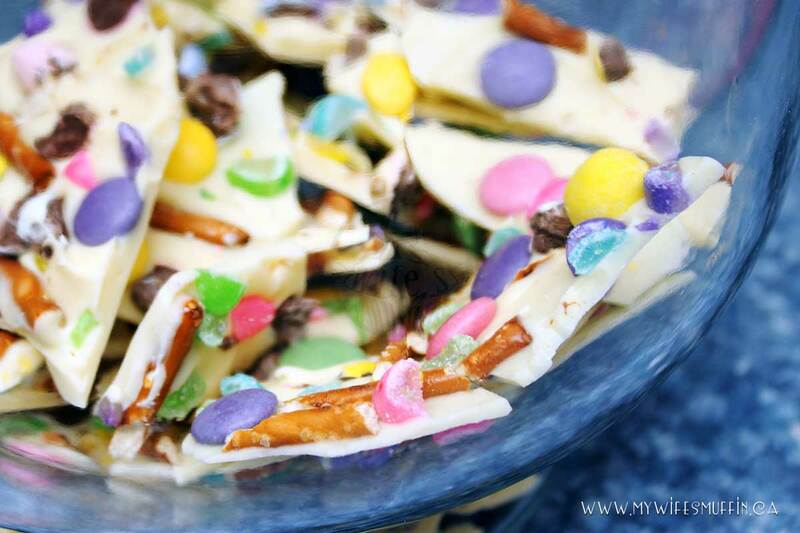 Well, that’s kind of how it was with this white chocolate candy bark recipe, too. Ours probably doesn’t stand out as different or very unique, but what may be a bit different than most recipes you’ll find is that my wife prepares the chocolate on the stove-top rather than the microwave. Sure it’s probably easier to melt it in the microwave, and it also probably saves on the dishes, but my wife prefers to watch the chocolate melt while gently stirring on a stove-top. She says there’s something relaxing about it, and that you just can’t get that same kind of vibe from pressing a button on a microwave. So, fair warning, there are probably easier ways to melt this chocolate than how we’ve done it. What we like about this bark is that various textures it offered. The pretzels gave it a nice crunch (and a hit of salt! ), while the coarsely chopped jelly beans offered a chewier texture. Plus, we loaded this bark up with goodies, so every inch of the bark is bursting with a variety of colours, flavours, and textures. ½ cup pastel coloured candy covered chocolate candies (like mini eggs, Smarties, etc). Coarsely chop candy covered chocolate. Set aside. Coarsely chop jelly beans. Set aside. Break up pretzel sticks into smaller pieces. Set aside. Place a tight-fitting metal bowl over a pot filled with about 2 inches of water (water shouldn’t touch the bottom of the metal bowl). Turn heat to high until water begins to boil and then reduce to medium-low and allow to simmer. Drop a small handful of chocolate chips in the metal bowl and gently stir with a rubber spatula. Once chocolate has almost melted, add in remaining chips and continue to stir slowly until chocolate has completely melted and runs easily off spatula. Pour melted chocolate onto prepared baking sheet (Caution: metal bowl will be hot! Use oven mittens, and avoid getting water in melted chocolate). Spread evenly over parchment paper with rubber spatula (approx. ¼ “thick). Evenly distribute coarsely chopped candies, jelly beans, and pretzels over chocolate. Gently press candies into chocolate. Refrigerate for approximately 2 hours, or until chocolate has hardened. Once set, remove from fridge and break into pieces before storing in an airtight container.